In John 9:1-7, we find a fascinating story of Jesus healing a man who was born blind. In addition to demonstrating Jesus’ miraculous ability to heal any kind of physical ailment, this story reveals that physical illnesses are not necessarily the result of sin, as people often assumed in Jesus’ day. 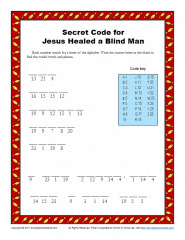 This Jesus Healed a Man Born Blind Secret Code Activity will reinforce for kids that Jesus can heal and does so for God’s glory. The activity can be used in a Sunday School, classroom, or homeschool setting. This is dummy copy intended to help us locate where the line will wrap for a landscape image of this size. This is dummy copy intended to help us locate where the line will wrap for a landscape image of this size. This is dummy copy intended to help us locate where the line will wrap for a landscape image of this size.